Sometimes it’s nice not to have to gather a small armada of people of to enjoy traditional ethnic cuisine. Sometimes it’s nice when you are presented a visually appetizing dish that has been artistically plated. Sometimes it’s nice to sit in a well appointed dining space where you feel like you could linger and talk with your friends for just a few more minutes. These are a few of the modern amenities I enjoy and have grown accustom to when dining in Vancouver. However when it comes some Asian cuisines (I’m looking at you Chinese food), it and their fervent customers have stubbornly refused to change. The reason for the inertia could be as simple as not wanting to change a winning formula or fear of being accused of being westernized and thereby not “authentic”. As far as I’m concerned, you can adhere to the high standards of traditional cuisine (the ingredients, taste, texture and cooking method of the food) and still modernize the portions served, plating and ambience in which the meal is offered. I may be wrong but I’m sure there isn’t manual out there that dictates that food be served in a mound that spans a minimum 9 inches across with an apex of at least 3 inches in order to qualify as a traditional dish. Vietnamese cuisine seems to be the one Asian food that is embracing modernity (and succeeding) in Vancouver. (I’m not Vietnamese, so perhaps there is a backlash toward these new eateries within the community that I’m not aware of). Along Davie street, near Emery Barnes Park, BaoQi is one of these forward thinking Vietnamese restaurants serving stylish plates of delicious Vietnamese food in a small (blink and you may miss it) and finely decorated dining space. With my back facing the wall of neatly arranged framed black and white photos, my co-worker and I waited at the communal table for our lunch. The first item to arrive was the beef wrapped in betel leafs served with rice and small salad of cucumber, lettuce & papaya (all cut with a fringed edge). The beef was moist, tender and seasoned well. 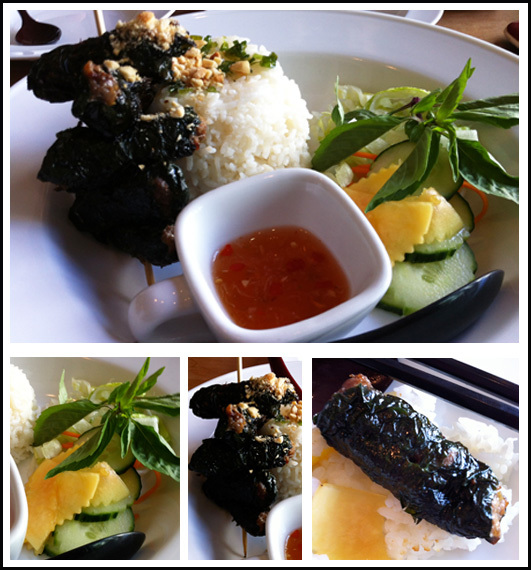 I was interested in the betel leaf, but I found I was not really able to detect any flavor imparted by the leaf. It simply served as an edible casing for the ground beef. The rice was presented in wide cylindrical shape; topped with peanuts making the carbohydrate more fragrant. 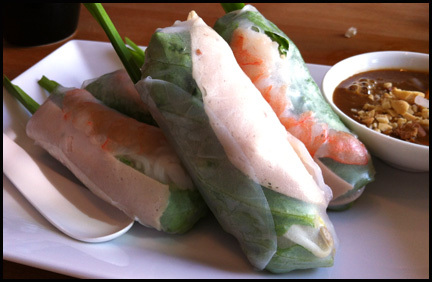 The next to arrive were the Summer Rolls. These were fairly standard salad rolls, except they were constructed into smaller chubbier servings instead of the longer baton shape. The plate contained the same amount of food as about 2.5 standard salad rolls found else where. All the ingredients (shrimp, pork roll [Cha Lau], green leaf lettuce, bean sprouts and basil) were fresh and the veggies gave the rolls the requisite crunch. These cute little salad rolls, with green onion sprouting out, were actually easier to eat and share amongst two people. 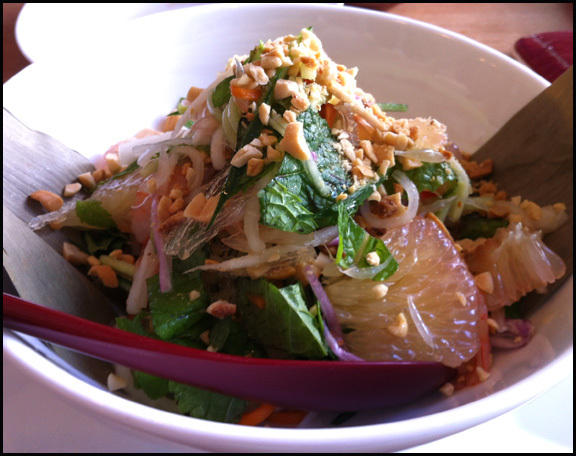 Last to arrival was the Pomelo Salad. Served in a deep white bowl, this dish was visual stunning with the juice vesicles of the pomelo glistening in the sunlight. The salad consisted of pomelo segments, slivers of pickled daikon & carrot, halved shrimp, slices of pork roll (cha lau), crushed peanuts, and Vietnamese coriander (which actually tastes like mint despite its name). When combined with the spicy dressing, the salad had different tastes and textures which created a refreshing mixture. I especially like that the shrimp was not over cooked and the unique fragrance and sweetness that the pomelo added to the salad. This was my favourite dish of the afternoon. I’m not calling for all Asian eateries to modernize but it’s nice to have the option especially when an occasion calls for it. 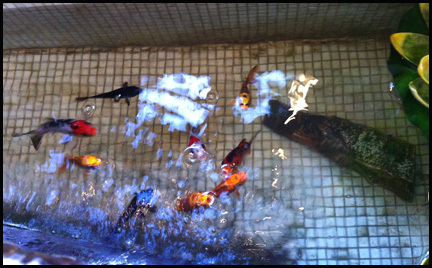 Sitting next to the koi pond at the front of the restaurant, my coworker and I had a leisurely and enjoyable lunch, catching up with one another in relaxing environment and munching on delicious and mostly traditional Vietnamese fare at BaoQi.